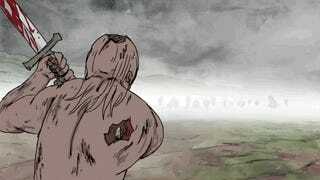 With a title like Odin’s Afterbirth, you would hope that this short animated film brought plenty of over-the-top gore. And it doesn’t disappoint with its grotesque story of a viking heck-bent on revenge, even in defiance of the Norse All-father himself. NSFW for violence and monster junk. Joseph Bennett released the first chapter of Odin’s Afterbirth in 2010 and the third and final chapter last year. Here is the whole thing stitched together into a single work of animated insanity. While the choreography becomes more inventive and fluid in the series’ latest installment, even at its roughest and rawest, this is a fun and bloody piece of violence.